It's compatible with V5 and V6 extruder hotend, suitable for general 3D printer. These 3D printer heads are small parts, please keep them away from children to avoid swallow risk. 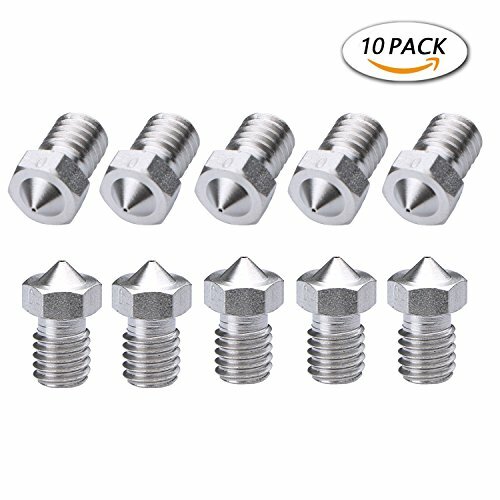 10 pack 3D printer nozzle, enough quantity to replace the old or broken one. Made of stainless steel, wear resistant, long service life. MK8 extruders nozzles output diameter:0.4mm,1.75MM Filament. Filament supported: ABS/ PLA/ PETG/ carbon fiber. Compatible with V5 and V6 extruder hotend. Installation: external M6 thread connection. Notice: these 3D printer heads are small parts, please keep them away from children to avoid swallow risk.